With MaxBulk Mailer 8.6.7 we added support for DKIM. DKIM (DomainKeys Identified Mail) is a method for validating the authenticity of email messages. When an email is sent with DKIM activated, it is signed using a private key and then validated on the receiving mail server (or ISP) using a public key on your domain DNS record. Using DKIM is opcional but quite recommended since having emails that are signed with DKIM appear more legitimate to your recipients and are less likely to go to Junk or Spam folders. In addition to verifying the authenticity of an email message, DKIM also provides a way for ISPs to track and build a reputation on your domain’s sending history. So, in order to use DKIM first you need a domain and you have to use an email address from that domain as the sender of your emails. For example our domain is ‘maxprog.com’ and our address ‘support’ belongs to that domain. If you don’t have a domain and/or use a gmail/hotmail/yahoo address for example, this is not for you. In addition, when adding a DKIM record it is also a good idea to add SPF and DMARC records. I will talk briefly about that below but I will wrote a complete post about email deliverability later. The process works like this: You publish a cryptographic public key as a specially-formatted TXT record in your domain’s overall DNS records. When a mail message is sent with MaxBulk Mailer, the software generates and attaches a unique DKIM signature header to the message. DKIM allows you to associate your domain name with your email messages, thus vouching for their authenticity. You create the DKIM by signing the email with a digital signature. This signature is located in the message’s header. Another quick method to improve your email delivery rates is to incorporate SPF, or the Sender Policy Framework into your DNS settings. SPF is an email validation protocol designed to detect and block email spoofing by providing a mechanism to allow receiving mail exchangers to verify that incoming mail from your domain comes from an IP Address authorized by you. As DKIM, SPF is not required but highly recommended.You will find more information on SPF here. Don’t worry, I will write a post about SPF later. A DMARC record is the record where the DMARC rule sets are defined. Once SPF and DKIM are in place, you configure DMARC by adding policies to your domain’s DNS records in the form of TXT records (just like with SPF or DKIM). You will find more information on DMARC here. I will also write a post about DMARC and email deliverability later. Best is you use this DKIM wizard. Just enter your Domain name and a DomainKey Selector of your choice. Then click on ‘Create keys’. You will automatically get a public and a private key. The public key is the one that will be added to your server DNS record and the private key to MaxBulk Mailer DKIM panel. If you scroll down the page a bit your will see “Step 1: Configure Your DNS Server With The Public Key.” with the formatted DKIM DNS record. You can see the SPF record followed by DMARC and finally the DKIM record (the last two entries). Here you can see that ‘Domain’ contains the domain name, ‘Selector’ the selector we have chosen in the DKIM wizard and finally the private key, as is, including ‘—–BEGIN RSA PRIVATE KEY—–‘ and ‘—–END RSA PRIVATE KEY—–‘. The password field can remain empty for the moment. You should get your DKIM record in the ‘ANSWER SECTION’ of the DIG response. With nslooup the response is the record itself. Note that it can take a few hours for your DNS changes to be propagated so be patient. 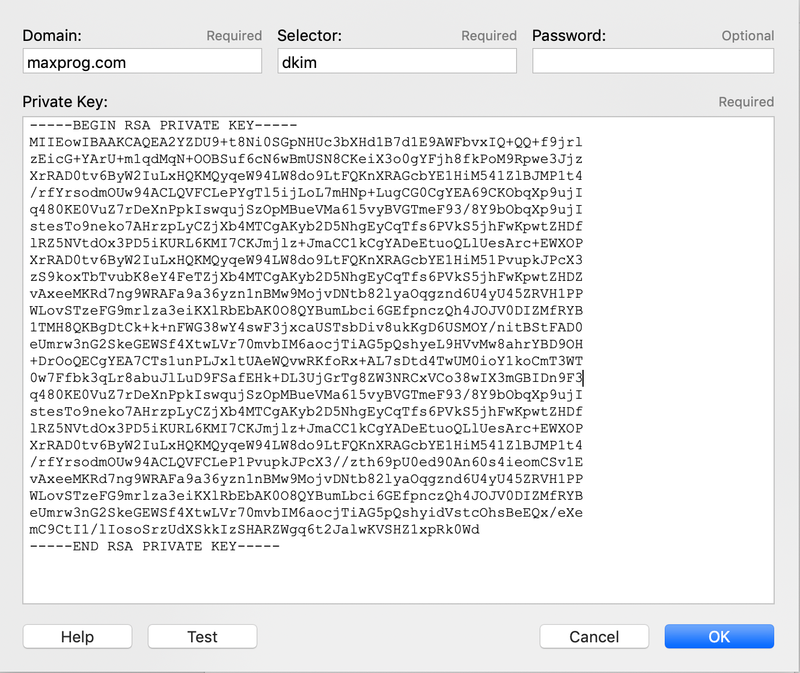 – DKIM Key Checker Recommended! It is very easy to validate your DKIM settings, just click on the MaxBulk Mailer DKIM window ‘Test’ button. The software will check everything, your DKIM DNS record and the private and public keys. MaxBulk Mailer will actually sign a dummy message and then try to validate it with the server. If you are successful then you can be sure that all your outgoing messages will be signed! – What are DKIM records? All the information above can be quite intimidating for most people, I know that so I recommend you to contact your server support. They should be able to help you with DKIM. They are used to handle that.